The inside of the dojo. 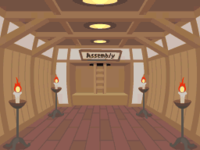 The Assembly Dojo is a dojo hidden under WarioWare, Inc. hosted by Young Cricket and Master Mantis in WarioWare: D.I.Y. with 32 techniques based on assembly. The player either sets triggers, actions or win conditions. The player gets awards that unlock records for every eight techniques. When the player wins a set of eight, a new set is unlocked. 1. The player must make "A" stop when it sticks to "B". 2. The player must make a block fall when the down arrow appears. 3. The player must make the star appear at a specific time. 4. The player must set a trigger where the circle appears when anywhere on stage is tapped. 5. The player must make it rain confetti when the game is won. 6. The player must set AI where the stage shakes when the block touches the ground. 7. The player must swap the two blocks. 8. The player must put all three blocks in one win condition. 9. The player must make the ball roll when it reaches the bottom. 10. The player must make the rocket launch when it reaches "0". 11. The player must make the ball roll when the light turns green. 12. The player must make the car go when the car is tapped and the light is green. 13. The player must keep the disc from moving when it hits the spikes. 14. The player must move the object outside of the stage. 15. The player must make the "+" jump inside the circle when it's tapped. 16. The player must make win conditions where any of the three can be tapped. 17. The player must make the object disappear when tapped four times. 18. The player must set the time trigger to "End" to win the game. 19. The player must make the button so it can only be tapped once. 20. The player must make AI for the button so it can't be tapped in rapid succession. 21. The player must make the object look like it's in the background. 22. The player must make the object move back and forth. 23. The player must stick the ball to the magnet. 24. The player must make the light be turned on and off to win. 25. The player must make the object disappear after eight taps. 26. The player must complete the animation. 27. The player must make the "!" appear ⅓ times. 28. The player must make a ¼ chance of the gap appearing left, right, up or down. 29. The player must make the arrow appear left or right with a 50/50 chance. 30. The player must make the fly go away when the light goes off. 31. The player must make the ball pass over all three numbers. 32. The player must make win conditions so an unlike item isn't tapped and the two like items are tapped. This page was last edited on October 1, 2018, at 23:44.